Anybody wondering why the Colorado Rockies never considered Ubaldo Jimenez to be in the same stratosphere as Troy Tulowitzki and Carlos Gonzalez got their answer today. Turns out the guy is hot-headed, and possibly a touch delusional. Jimenez, who publicly steamed last week about the lack of respect shown him by the Rockies when they traded him to Cleveland rather than sign him long term, got his first chance to face his former team on Sunday. Before long, he had sent Tulowitzki to the hospital. Tulowitzki’s drilling follows a time-tested tradition of players being punished for their teammates’ actions, be it the next hitter in the lineup dodging fastballs following a home run, or a slugger going down as part of a pitcher protesting a big inning. Jimenez said that his pitch was unintentional (it “got away,” he said), but that’s clearly not the case. Rockies pitcher Jeremy Guthrie—in his first season with Colorado—said he knew what was coming based on where the catcher was setting up. The umps, clueless, did not issue an ejection. Jimenez was 6-9 with a 4.46 ERA when the Rockies traded him last season. Jimenez is 1-4 with a 7.43 this spring. The guy gave the Rockies scant reason to lock him up last season, let alone rework his contract long before it was set to expire. 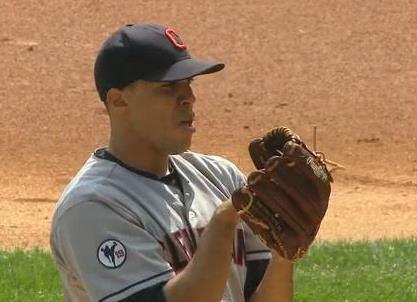 He currently appears to be working his way out of the Cleveland rotation altogether. He should focus on things other than misplaced anger directed at guys who don’t deserve it. Colorado and Cleveland don’t face each other this season, so the two won’t meet again short of the World Series. Should Jimenez face his old mates next year, however, it’s pretty certain that today’s activities will be revisited, with vigor. Update: Rockies skipper Jim Tracy didn’t much care for Jimenez’ act, calling him “gutless” and calling for his suspension. Update 2 (4-02): MLB didn’t much care for Jimenez’ act, either. Update 3 (4-02): Watch it here. Update 4 (4-03): Jimenez isn’t exactly reticent about the whole thing. Update 5 (4-03): How not reticent? He’s appealing his suspension. I’m sure it makes no difference code-wise, but I’m curious — what sort of suspension would Jimenez have gotten had he admitted that he intended to hit Tulowitzki? For pitchers, a five-game ban effectively docks them one start. That could have been increased to 10 in the face of an admission, but more likely he would have just been hit with a higher fine than the (undisclosed) one he received.